Advanced Analytics is a powerful, yet easy to learn and use interactive analytics solution that enables you to increase organizational and customer intelligence, shape strategic priorities and make informed business decisions. Bring your CRM data to life and maximize your investment in infor CRM by analyzing data and key performance indicators from across your organization for a deeper understanding of business and team performance and to identify the drivers of and barriers to success. With Infor CRM Advanced Analytics, users at every level of your organization can monitor productivity, analyze trends and identify issues that enable them to focus attention and resources on the most profitable business activities and provide the insight to make decisions that positively impact your bottom line and extend your competitive advantage. 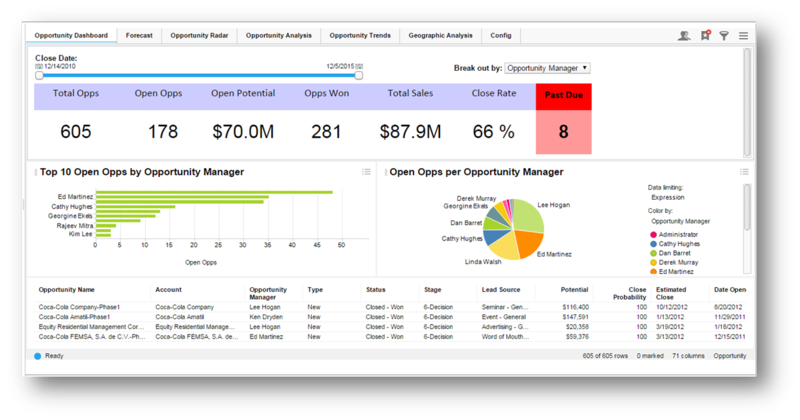 Infor CRM Advanced Analytics provides pre-built, fully-integrated dashboards that span all CRM functions, including Sales, Marketing and Support. Users can easily analyze data by defining parameters and metrics then interacting with dashboard visualizations via filter, drill and pivot capabilities. Analyze CRM data as well as data from multiple external sources such as ERP, CTi, spreadsheets, CSV files and web services for a holistic view of customers and an understanding of key business processes. Dashboard content can be easily customized and managing access to sensitive data is simple, as security is governed by user and team profiles in Infor (Saleslogix) CRM. 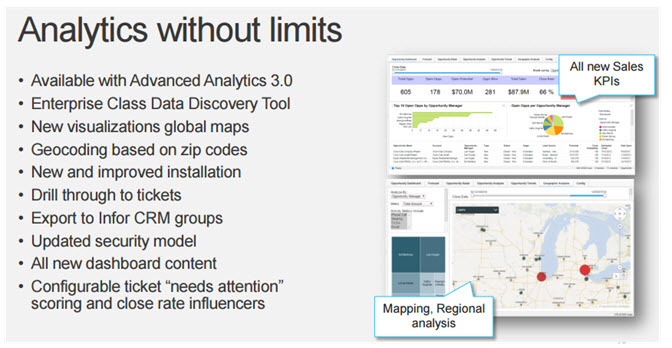 More Advanced Visualizations- get a holistic view of what is available! *Infor CRM Advanced Analytics requires Infor CRM v7.5.4 or higher. Utilize interactive controls to define dashboard parameters and metrics, methods of calculation, data to display and more. Select data elements, mark records and drill into multiple levels of details. Create new visualizations with drill-down data and change the way data is summarized through pivoting. View a list of individual records that contribute to the values in a dashboard. Locate specific records that are causing issues or contributing to success. Utilize hierarchy, range and list filters to limit dashboard data based on a date range, opportunity value, individual sales person and more. Select from multiple graphically-rich charts and visualization tools including Bar, Pie and Line charts, Combination charts, Tree Maps, Heat Maps, Scatter Plots and Bubble Charts. Include multiple analyses as tabs within a dashboard. Each tab may contain a set of charts, grids and other controls for analyzing data. Access convenient toolbar controls for undo/redo, export to Excel®, PDF and CSV, and to print charts, tables or entire dashboards. Leverage a comprehensive library of pre-built, interactive dashboard content and metrics that span CRM functions, including Sales, Marketing and Customer Support. Assess key sales performance metrics with pre-built dashboards covering Sales by Geography, Historical Sales, Sales Forecast, Sales Pipeline, Win/Loss, Opportunity Trends, Ranking and Productivity Analysis. Measure the effectiveness of marketing campaigns using the Campaign Analysis dashboard to analyze response metrics and determine ROI. Improve customer service and support by acting on insights provided by dashboards covering Ticket Volume Trend, Open and Closed Tickets and Ticket Activities. Deploy Standard User Licenses for all CRM end-users and Professional User Licenses for developers and administrators to create and publish custom dashboards, tabs and queries, integrate new data sources and manage user profiles. Infor CRM Advanced Analytics is fully-integrated with Infor CRM, enabling seamless interaction, quick access via the navigation bar and single sign-in. Rely on sophisticated security to manage administration rights and access to sensitive data. Infor CRM Advanced Analytics strictly enforces the data security profiles defined in Infor CRM for users and teams. In-memory analytics and data compression techniques enable fast, powerful analysis of data and minimize use of memory. Analyze data from multiple sources of data, including Inifor CRM, ERP and business management solutions, Web services, CTI/Telephony systems, spreadsheets and more. Perform administration quickly and easily via the Infor CRM Administrator and a flexible data mapping tool. Increase organizational and customer intelligence by analyzing data from across your business. Make informed business decisions and shape strategic priorities based on actionable analysis. Extend your competitive advantage by focusing attention and resources on the most profitqble business activities. Enable users at every level to gain insights they need to identify drivers of and barries to success.